So far, we've covered the opening hymn, Bidding Prayer, In the bleak mid-winter – Harold Darke, Adam's Fall – Richard Elfyn Jones, Love came down at Christmas – arr. Stephen Cleobury, How shall I fitly meet thee – Bach, I saw three ships – arr. Ledger, Illuminare Jerusalem – Judith Weir, and the hymn "O little town of Bethlehem", A spotless rose – Herbert Howells, The Lamb – John Tavener, and The Angel Gabriel – Pettman. 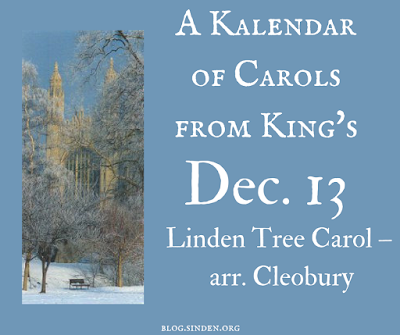 Cleobury's "Cherry Tree Carol" was sung as far back as 1986. But here he has written a new "Tree" carol, this time setting another traditional carol text. My scattered records indicate that "The Linden Tree Carol" was sung in at least two services in the 1930s, but I don't think it has been included since. ‘My soul does magnify the Lord!